The mystical land complete with Tales of Shangri-La & Dragons with an abundance of wildlife with forest cover almost everywhere; abode of peace at the ‘Lakhang’ with age-old practices of Tibetan Buddhism; curvy and picturesque mountain roads dotted with ‘Chortens’ ( You have to cross them from the left; high mountain passes with white flags against the blue mountains and snow caps; the magnificent ‘Dzong’( Monastic Forts) for administration and justice; men and women dressed in ‘Gho’ and ‘Kira’ respectively… Yes!!! That’s a small glimpse of the small Himalayan kingdom known as Bhutan. 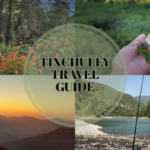 Initially we planned to cover the country from the West (Phuntsholling/Jaigaon entry point) to East (Trashigang), but for time constraint we restricted our plan till Bumthang valley in central Bhutan. We started at around 12.30 AM from our residence in Kolkata and took NH2A towards Guskara/Bolpur. The road surface here is pretty good with some occasional narrow bridges. The only place where it is still broken is where the road passes below the rail line. Just before Bolpur the road goes straight towards Sriniketan road to take a bypass of the Bolpur town. The road after Sriniketan has a good surface, other than an under construction bridge for a very long time now. After crossing the bridge, we stopped somewhere in a heavily wooded area with the river running beside for some tea and biscuits that we were carrying with us. After a while the road reaches Purandharpur and here we took a left turn towards Siuri town. After about 8-9 kms from Purandharpur, we reached Siuri and continued through the middle of the town to reach NH60 highway and took a right towards Tilpara barrage over there. This road (NH60) goes towards Moregram on NH34 through Rampurhat and Nalhati. NH60 is almost in shambles now and there are medium to large potholes strewn all across. Bad roads with heavy trucks and buses make it an extremely dusty destination to drive on. However, we had only a short distance on this road – after about 4 kms we crossed the Tilpara barrage with extremely broken roads over the barrage. After another couple of kms, we reached Seorakuri more and took left there. This road will lead us to Massanjore in Jharkhand through Ranigram and Kumirdaha. The first 250 meters from Seorakuri more had no roads. The next 7 kms has occasional potholes, some of them large, till we reached the Bengal-Jharkhand border. From here onwards the road surface was fantastic and we maintained a decent pace. This road goes through some villages on the way namely Ranigram, Raniswar, and Kumirdaha till it reached Massanjore reservoir. After another 25 kms we reached Massanjore reservoir. Here keeping the barrage on your left (do not cross the barrage) we continued straight. Some makeshift shops come up on the left and we stopped for some tea and breakfast which we were carrying with us. It was still early morning and we were able to watch some birds by the reservoir. After tea we continued straight through some beautiful narrow roads with fantastic surface. 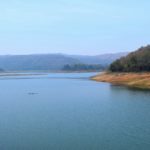 The road travels through some beautiful forested plateau area beside the reservoir and after about 25 kms we reached Pattabari. From here we took a left towards Dumka. This is actually the Rampurhat – Dumka highway and from Pattabari, Dumka is another 15 kms away and the road has just been built. If someone wants a stopover at Dumka, the best option is to stay at a hotel called Maihar Garden. Locating the hotel is very easy – it comes up just before Dumka town on the left. After reaching Dumka town we kept driving straight on the main road through Dumka town – a little congestion of local transport, cycles, autos that has to be taken in stride. Once we keep going straight through the town just at the clock tower there is a roundabout from where the road to the left which is the Dumka bypass. 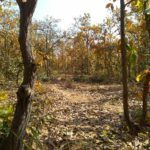 The road straight from here is the Dumka – Bhagalpur highway… so we just kept moving straight and finding the way is easy. From Dumka till Bhagalpur is about 115 kms and the first part of the road is pretty good with nice surface. The landscape is very quaint and pretty with small hillocks as you drive. Just after we crossed into Bihar at Jharkhand-Bihar border near Hansdiha, we started noticing some damages on the road surface starting from a place called Baunsi. There were occasional potholes and little damage to the road surface, but it was manageable and we were able to keep a steady pace. After a place called Dhaka More the frequency of the potholes increased and after we crossed Punsiya the potholes become larger, wider and some of them will qualify as craters, and these slowed us down considerably. Bhagalpur is about 40 odd kms from Punsiya and we had to negotiate the bad roads for this part. Once inside Bhagalpur, we take a bypass of the main city traffic but I decided to follow the main road. The road very congested goes up a flyover above the Bhagalpur railway station and then goes right. After the flyover keep going straight wherever there is a crossing through non-existent and bombed out roads inside the city. After a couple of kms on this road, there is a wide divided road going to the left – this is the Vikramshila Setu road. We took this road towards Vikramshila Setu and were outside the Bhagalpur city… the total ordeal lasted not more than 20 minutes. The Vikramshila Setu comes just after a while on the Setu road. It is a very long bridge on the Ganges and stands 4.7 Km long. The plan is to connect with NH31 through this bridge. Just 7-8 kms ahead after the bridge ends is a place called Naugachia where we would meet the NH31. Hotel Vaibhav Inn is a newly built hotel run by Bengali owners and we spoke with them in Bengali. The food was good and service was very good. After Breakfast, we started from Hotel Vaibhav Inn at about 8AM, After about 3kms from here we reached the highway NH31 at Naugachia and took right. From here onwards the roads were fantastic and I could put my left foot to rest, keeping 100 -110 on the speedo, so that we did not hit the occasional goats and cows crossing the road. From Naugachia till Purnia (75 kms) the road is fantastic but undivided running through some villages where pedas are sold by teenage boys to all passing buses; we enjoyed the drive very much. 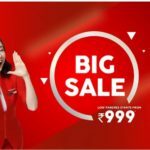 Once we reach Purnia, there is a round-about and we took a right here towards Dalkhola and we basically did not have to negotiate the Purnia city traffic at all – the NH31 bypasses the city. 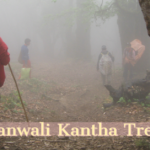 From the round-about at Purnia (Gulabbagh) till Dalkhola is about 35kms. From here, the divided highway starts and driving becomes much relaxed with the fantastic road surface. At Dalkhola, the flyover runs on the other direction of the road and vehicles towards Siliguri has to take the route through the shops on the NH which can slowed us down a little. From Dalkhola till Kishanganj is 25kms and the divided highway NH31 continues, but for this 25kms the surface of the road is damaged and the upper surface of the road has been peeled off. These are not potholes but irritating enough to slow a vehicle down. I drove wither on the right-most side of the road or the left-most side to avoid the peel-offs of the road surface. Anyone driving down on this road should be careful of the 2 bumpers that come up all on a sudden near the Kishanganj railway station. We stopped at Kishanganj for a cup of tea at some dhaba and mainly to clean up the wind screen massively stained from the onslaught of insects in the evening. From Kishanganj the road becomes good again till Islampur (about 30 kms) where the divided road merges to become undivided road through the Islampur town. At Islampur, I decided to tank-up because it was dark already and I last filled up at Kolkata before the trip. After filling up at Islampur and negotiating the slow traffic through the town, we hit the divided highway again and travelled pretty fast till the road became undivided again before Bagdogra. Please be cautious here as there are several potholes on the road and I hit a couple at night pretty badly, trying to make my way faster. At some stretches, there is no road for a few meters since the roads are under renovation. This way we reached Siliguri and take our late lunch at 5 PM. We crossed the Coronation Bridge and kept moving towards phunsholing followed NH31 through Nagrakata, Binnaguri, Birpara, and Madarihat till we reached near Hasimara. The roads are beautiful through the forests and almost perfect with some occasional potholes near settlements. The road looked so fantastic at night, lined with reflectors with the Dooars and the tea gardens on both sides of the road finally reached Jaigaon at 8:30PM and choose “Hotel Prashant” for the night. Today we covered 830 km and Driving time was 21 hrs. In the we showered fast and headed for the breakfast table. The breakfast at Prashant was as usual and we loaded ourselves heavily, not knowing if we could get lunch somewhere along the way. We started around 9:00AM from Jaigaon and crossed the border gate to enter Bhutan. Jaigaon is the border town for India with Bhutan and on the other side of the border is Phuntsholling. The difference between the 2 border towns is stark with Jaigaon in perfect disarray and Phuntsholling absolutely neat and tidy and orderly including the shop signs boards (all in green and white). At Phuntsholling, we stopped near the Zen restaurant and parked our vehicle in the neatly marked space beside the road. We collected our Individual permits and car permit from the respective offices i.e. Permit office and RTSA Office. The Indian cell phones work around Phuntsholling for a while but will cease to function as we go inside, so we took two 3G SIM cards from Tashi Cell. As our GPS device would not work in Bhutan, we planned to use the Google navigation using the 3G SIM data connection but it was only till later that we found out the data was not working properly and we had to depend on locals for road direction. We started on our way towards Thimpu which was about 180 kms away. A few kms of uphill and we reached the immigration check-point where we had to get our permits and car permit stamped from the officials here. It is important to get your papers stamped at the necessary check points although nobody may stop you to do so on the way. This is necessary as you may be questioned at other check posts where you are stopped. Also I had to remember not to honk inside Bhutan if not necessary. I usually don’t use the horn even while driving inside India, but the idea of not honking on curved mountain roads and blind curves will be a risky proposition and we soon found that out. But people generally drive on their side of the road and I got used to not honking at blind curves but being more attentive. By this time only we saw a weasel cross the road, lots of birds, Rhesus monkeys, Grey Langurs. Where we stopped there were a lot of small birds and we also saw a small Pica nearby. After a while, the roads started getting narrower and then a little broken near about Chukha. Throughout the road there is no proper place for having lunch and we had some food that we were carrying with us. The roads became better near about Chapcha and after that we reached Chuzon. It is from this place the road bifurcates to Thimphu and Paro. Finally we reached Paro before 7:00PM and check out the “Hotel Singhee”.Very nice hotel at the Heart of the city and service of the stuff was extraordinary. Though It has no parking facilities. We are very tired so take our dinner at 9.30 and go to the bed. 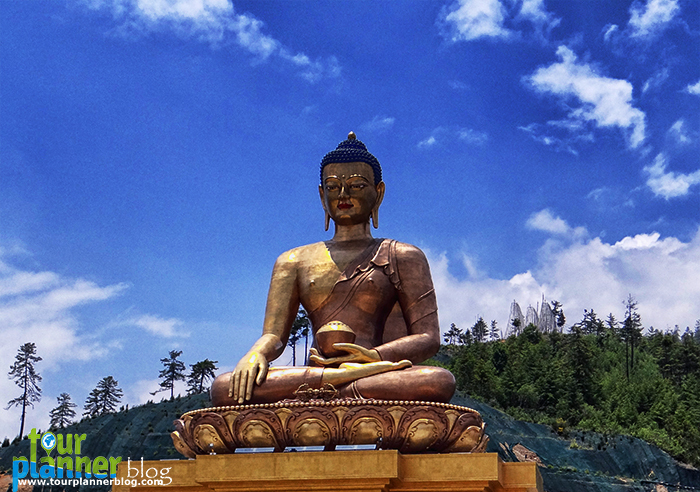 Thimphu to Punakha is really not that far and can be reached in 2.5 – 3 hours, so we were not very worried. We had a heavy breakfast and went to the immigration office inside the town. We could locate the office in the town without hassles after asking a couple of locals. The immigration office for permit extension is just at one end of the handicraft market and is easy to locate. We put in an application in the concerned window and were told to return after an hour to collect the same. 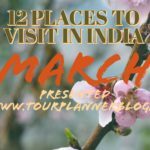 We needed to fill in a small application form where we needed to put in the Hotel name and place where we would be visiting along with a photograph of all three persons and a photocopy of the main permits obtained from Kolkata. The process is simple and easy enough. After going out from the RSTA office we were made our Sightseeing At Thimpu. 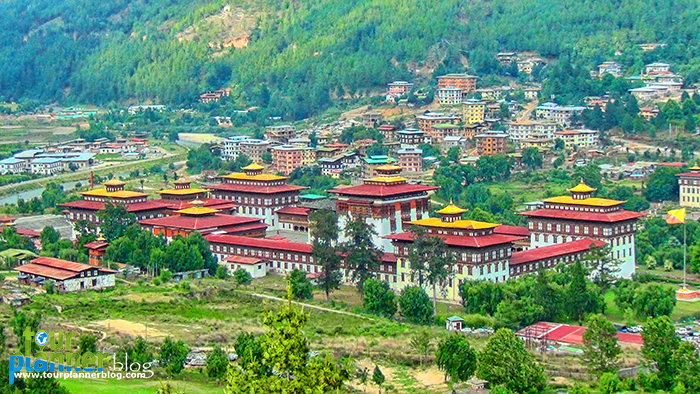 The various tourist attractions in Thimphu are Tashicho Dzong, Simtokha Dzong and Stupa. Tashicho Dzong, the main secretariat building,houses the main government departments, all te Ministries, the National Assembly Hall, the office of the King and the Throne Room and summer headquarters of the Central Monastic Body. It is also the summer residence of the monk body and the religious chief, the Je Khempo. This dzong was first built in 1661, and dominates the town of Thimphu. Except the central keep, the entire structure was rebuilt in 1961-62. In the National Assembly Hall, there is the two-storey high statue of Lord Buddha, wall paintings which depicts the twelve stages of Buddhahood and columns of Kanju and Tenju that depicts the supremacy of religion over politics. The yearly Thimphu Festival is held in the courtyard directly in front of the National Assembly Hall. The two largest Thankas are housed in the Uchi, the tall citadel-type temple in the middle of two courtyards. These thankas are displayed to the public only once in 25 years. During the renovation of Tashicho Dzong, the Uchi was left undisturbed. 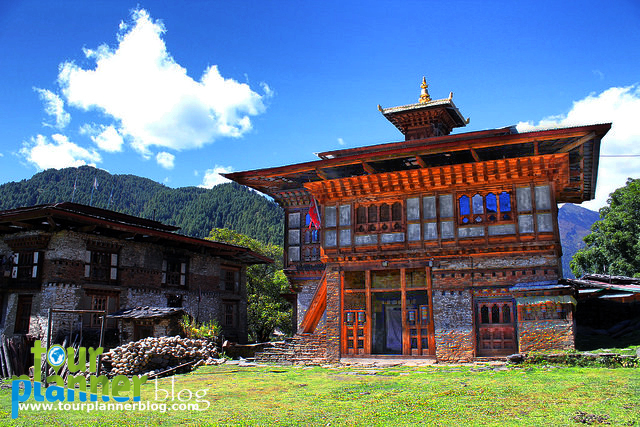 The Simtokha Dzong is situated on a lofty ridge, about 8 kms from Thimphu. 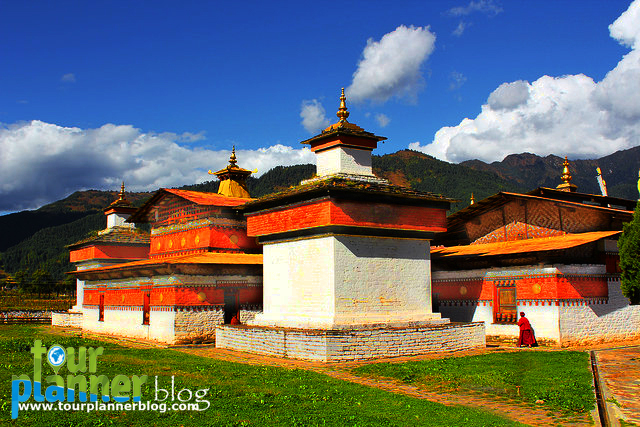 This dzong was built in 1627 by Shabdrung Nawang Namgyel, the first king of Bhutan. This dzong is the oldest Dzong in Thimphu and gateway to the Thimphu Valley. This dzong still enjoys the strategic importance as it did in 1627. The Dzong houses Rigney School for Dzongkha and monastic studies. There are beautiful frescos and slate carvings in Simtokha. 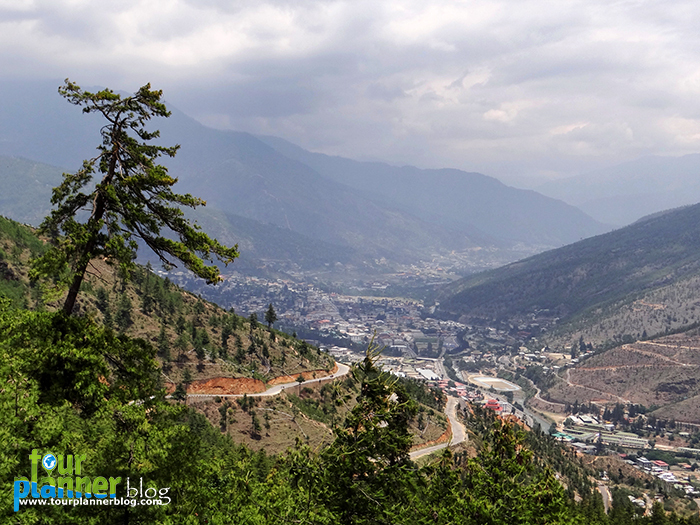 The most enjoyable experience of being in Thimphu is to taking strolls around the streets here. 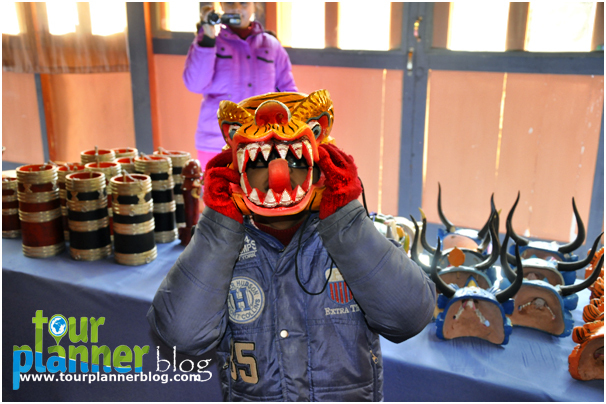 Weekend markets of Thimphu sell everything under the sun that is being created in Bhutan. Hordes of villagers sell vegetables, newspapers, red chillies, traditional Bhutanese masks, and carpets. 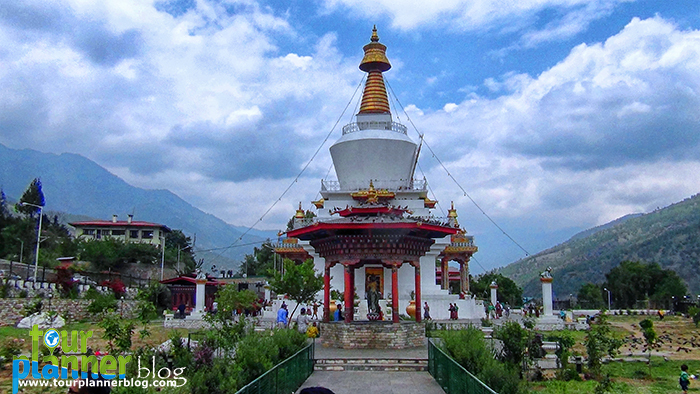 The stupa-styled monument is also situated in Thimphu. This monument is dedicated to the late King, His Majesty Jigme Dorji Wangchuck, the father of modern Bhutan. The paintings and statues inside the stupa provide a rare insight into Buddhist philosophy. on our way to Punakha which was about 75 kms from here, but after a while we made a mess of road directions given to us and ended up wasting about half an hour. At Semtokha we were to take a loop and climb but we went straight and messed up. Anyway we were on our way to Punakha and on the way we were to cross Dochu La. About 4kms before reaching Dochu La, there is one immigration check point and we had our permits checked and stamped out here but they did not want to see the car permit. We stopped on Dochu La top for a while for photographs and then carried on. The Dochu La top is known to have birds in plenty but we did not see many except some Blue Rock Thrush. 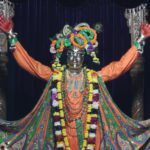 The mountain top is also house to 108 Chortens out of which only 54 can be seen now. The road to Punakha is a mix of good and bad and cannot be called good road surface. However, from a mountain road perspective it was quite manageable and we reached Lobesa by 2:00PM. At Lobesa, we saw an Indian Oil petrol pump and tanked up. 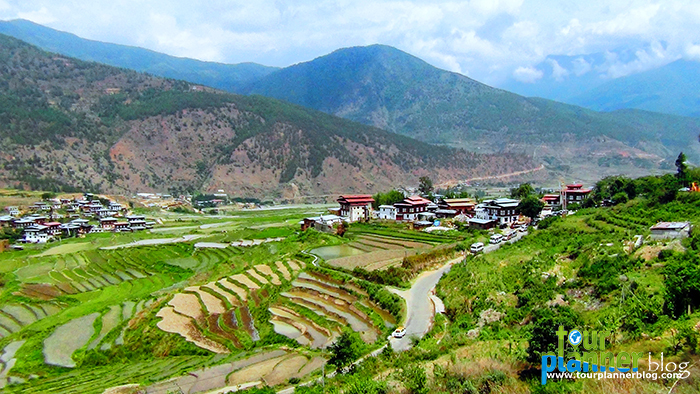 Lobesa is a small place from where the road forks to the left towards the Punakha valley. This small place has 2 petrol pumps – one Indian Oil where we tanked up and the other was from the Bhutan Oil Corporation. From Lobesa to Punakha is about 12-15 kms and Punakha town also has a large Indian Oil outlet as well. We were booked at the Zangdo Pelri hotel which is outside Punakha. 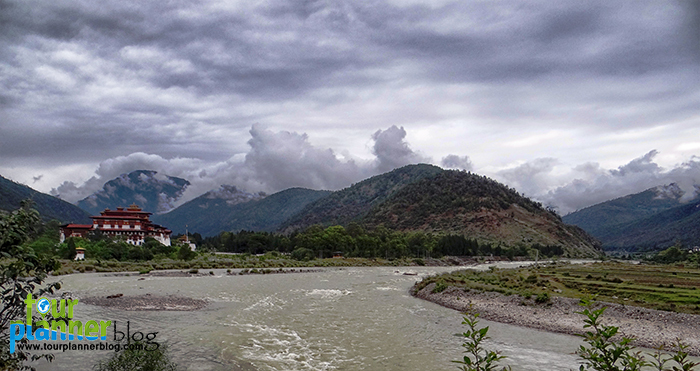 Just before reaching Punakha, from where the entire Punakha valley can be seen, a road goes to the left towards Talo. The good resorts and hotels are on this road. 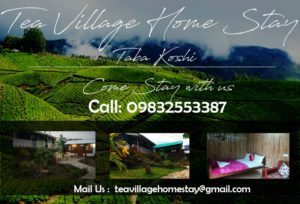 In addition to Zangdo Pelri, the Meri Puensum resort is also well recommended place to stay. 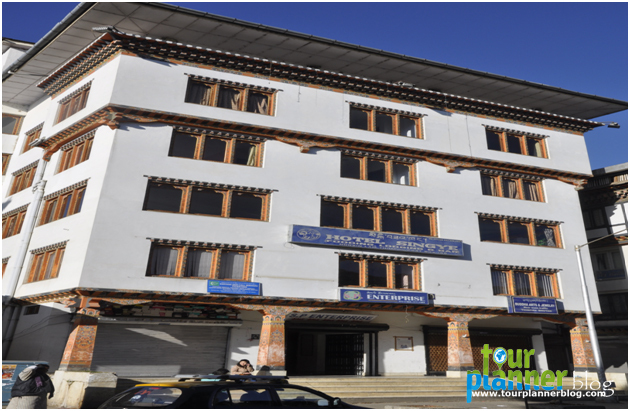 From the beginning of the trip, the name Jakar was not striking a chord with locals, they could understand the name Bumthang and so off we go towards Bumthang today. It was quite a long drive today and we had to cover about 200 kms. Our first target was to reach Pele La at an altitude of 3325 meters. The road from Punakha till sometime after Wangdu was pretty good but soon afterwards the road started turning bad and some places had no surfaces at all. The locations looked remote with quaint villages (few houses) that came along after long intervals. 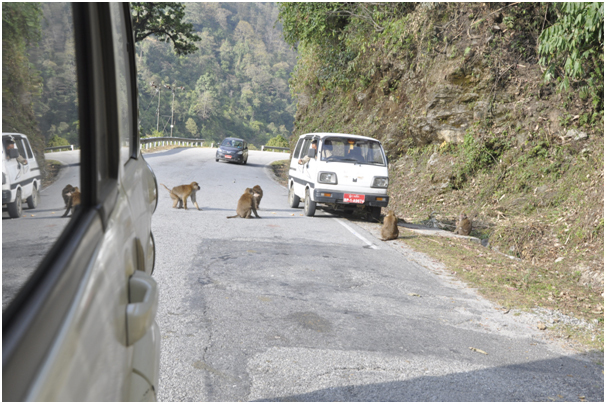 Traffic was very low – to the tune that we saw probably 5-10 vehicles in the first hour after crossing Wangdu. These colorful small birds of the size of my palm are so restless that they do not sit at a single place for more that 2-3 seconds and lives on nectar from flowers.. The road started becoming better once we started climbing the Pele La pass and once we reach the top there is a chorten and is quite peaceful, serene and pleasant. From Pele La towards Trongsa, the road is good and just after this; there is a road that goes down to the Phobjika valley. Just before reaching Trongsa, we could see the hydroelectric project to the right and the Trongsa Dzong perched on top of a hill. It was a wonderful sight and we again stopped for a while. It seemed that we had reached Trongsa and were just outside the town, but the road winds for another 8-10 kms for making way to cross the river in order to reach Trongsa. 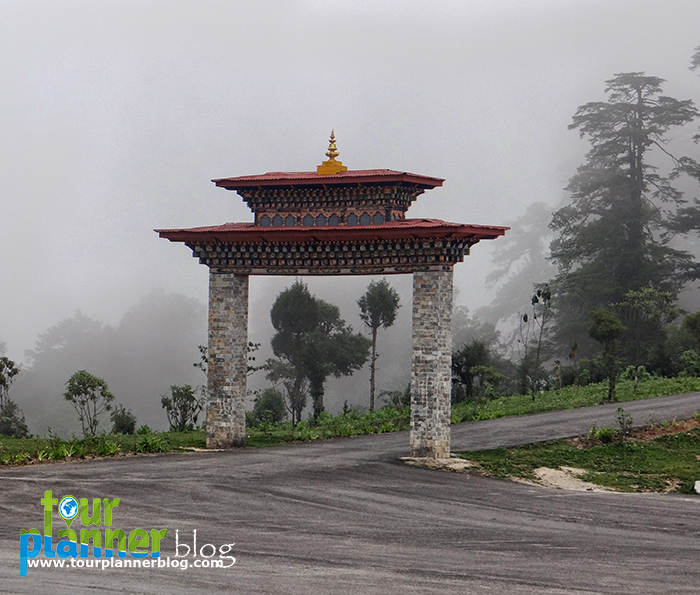 In all it takes about 5 – 6 hours to reach Trongsa depending on the number of breaks.. Roads were very good and we reached the Yotong La top in 45 mins. The pass was a mystic kingdom engulfed in clouds all around and even then a few birds were moving around in the clouds. The road descends into the Chumey valley at a place called Gyathshe. This place had some government offices and school along the way. The place was beautiful and at first we thought that we had reached Jakar. But this was a different valley called Chumey valley. 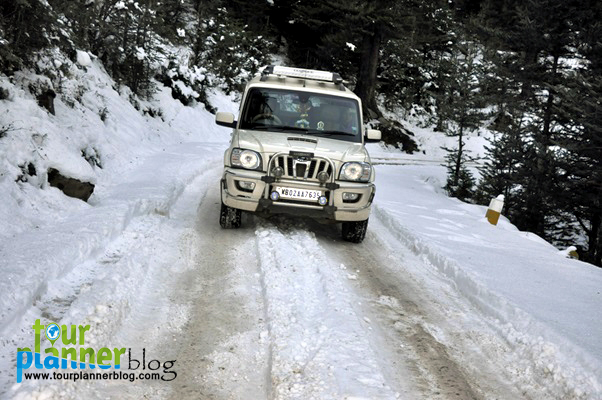 So we kept on moving and the road forks at a place called Nangar in the Chumey valley. The road going up to the left is the one going to Bumthang valley, Jakar. 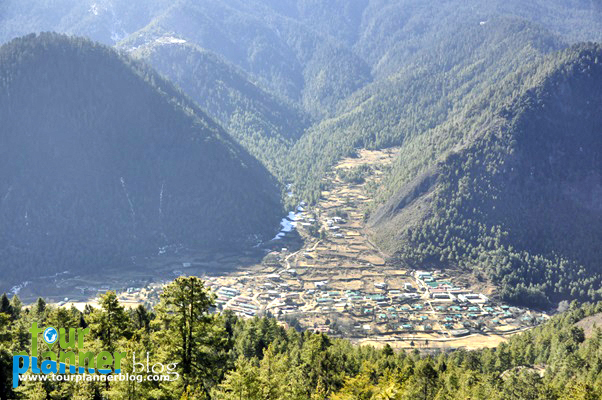 From Nangar, Jakar is another 18 kms away – the road goes up and crosses a small pass for entering the Bumthang valley. We could identify it was a pass because of the Chorten and flags put up at that place. After the unnamed pass, we emerged from the forest and could see the Bumthang valley in front of us. Bumthang was colder from the previous valleys and in my opinion was much more beautiful than the others that we had seen previously. Lhodrak Kharchhu Monastery: Located above the main town, about 3 km from Chamkhar town, the monastery was founded by Namkhai Nyingpo Rinpoche in 1984 who was recognized at a very young age by H.H. the 14th Dalai Lama and H.H. 16th Karmapa as the reincarnation of a Tibetan lama whose spiritual lineage dates back to the nearest disciples of the great 9th century master. Since then the monastery has developed considerably with increase in number of monks to almost four hundred. 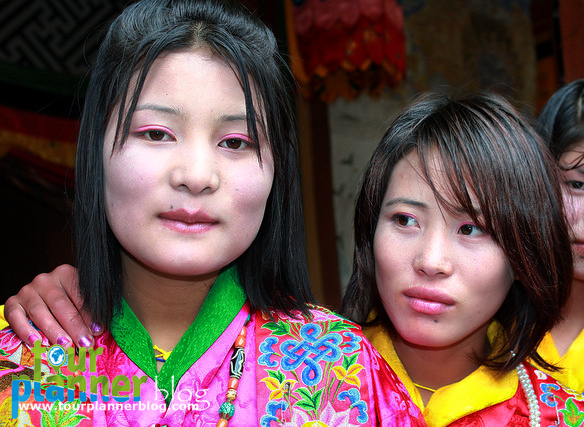 The monastey has become part of an extensive effort to preserve and revitalize Tibetan culture. The monks regular curriculum include reading, memorizing the daily prayers, learning dharma dances, drawing mandalas, learning the melodies of sacred rituals, learning the use of ceremonial instruments and the art of making sacrificial objects, grammer, poerty, karika along with the basics of contemplation and instruction on the different stages of tantra. After taking a heavy breakfast from hotel we start at 9.30 for probjika Valley.From Pele La towards Trongsa, the road is good and just after this; there is a road that goes down to the Phobjika valley. We reached at Probjika at 3.30 p.m.. If anyone miss Probjika he should miss one of the best valley of Bhutan. After check in the Dewachen Hotel we go for the Probjika Dzong. Spend the evening visiting the Black Neck Crane Centre and exploring the Probjika valley. As expected we started at 6:00AM sharp. As Yotong la came up it was very cloudy up there again and we could see that it had snowed a little bit overnight. It was like a mystic atmosphere all around and we wanted to stop, but our schedule prevented us from doing so. The temperature outside was showing as -3 degrees. By 7:50AM we had reached Trongsa after covering the first 70 kms – not bad. We had planned for a breakfast with Maggi at Oyster hotel in Trongsa. After breakfast, we started off again expecting bad roads but nothing happened for the next 10 kms or so. For the first 10 kms from Trongsa, we saw an Indian Oil petrol pump, then lots of workers from India for the Hydel power project that is being built. 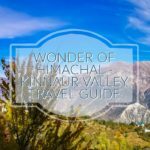 , the journey was great through winding mountain roads and I could cover 40-45 kms in the first hour. By this time only we saw a weasel cross the road, lots of birds, Rhesus monkeys, Grey Langurs. Where we stopped there were a lot of small birds and we also saw a small Pica nearby. After a while, the roads started getting narrower and then a little broken near about Chukha. Throughout the road there is no proper place for having lunch and we had some food that we were carrying with us. The roads became better near about Chapcha and after that we reached Chuzon. It is from this place the road bifurcates to Thimphu and Paro. The road to Paro crosses a bridge and goes to the left from here. From here on we actually enter the Paro valley and the roads are almost straight and has a fantastic surface. I drove pretty fast here between 80 and 100 as it was getting dark fast now. Finally we reached Paro before 5:00PM but getting to the hotel was a challenge. After some phone calls we find a beautiful resort name Ugyen Phendeyling Resort, Check in there and enjoy the beautiful scenario of Paro. We woke up comfortably around 6:30 AM and got ready. Breakfast was ready by 8:00 AM at the dining area. First we planned to see the Paro Dzong. The Dzong perches just above the town as we saw last evening while we drove beside it, but to reach the Dzong and the museum by car we needed to cross the river and take a long route for something that can be climbed in 5 minutes on foot. Last evening when we arrived at Paro most of the shops were closed down and now also inside the town the shops were opening. The town that boasts of an airport is really tiny when I compared it with any other hill settlements in India. 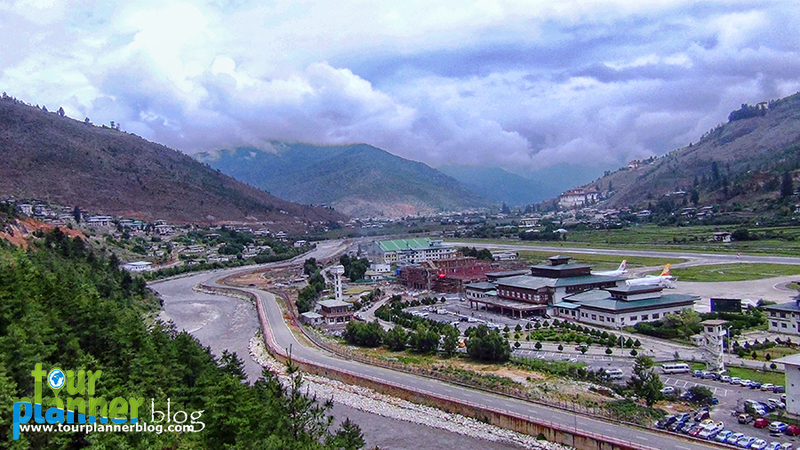 It is possible to walk from one end of Paro to another within 10 minutes – how lovely is that? All areas are clean and maintained and I just fell in love with the place. Visiting the Dzong was a wonderful experience. This being a weekend the offices inside the Dzong were closed but we could get inside and take photos all throughout. Inside the Dzong seemed very peaceful and serene. From inside the Dzong, the sprawling Paro valley can be seen in its entirety. After spending about an hour there we wanted to get moving for Chele La. I checked the fuel meter and decided we did not need to tank up. Paro has a couple of petrol pumps and Indian Oil petrol pumps can be seen at major locations. We drove through the town once again and beside the airport where we noticed an interesting thing. There are roads on both side of the airport and last night we had taken the narrow road on the East side of the runway. Today when I wanted to take that route back, I found that there is a signboard hanging “Road Closed temporarily – Flight landing”. A new experience for me – so we took the road on the West side of the airstrip and found out that this was a better road. After the airstrip comes a place called Bondey – from here we crossed the bridge on Paro Chu to the right and started climbing the Chele La pass. From here Chele La is about 34 kms and this pass is located at an altitude of 3988 meters giving access to the Haa valley. All these roads are maintained by the BRO of the Indian Army under Project Dantak. The road to Chele La was fantastic considering that this is a high altitude road and we breezed to the top in around an hour’s time. The road is incredibly scenic with lots of wild life (mainly birds) along the way. In a lot of places, we could find snow and the road surface frozen from overnight snow freezing out, making it a dangerously slippery surface to drive on. Unlike the popular passes in India (read the incredibly crowded and hyped Rohtang) there is no crowd of tourists here and I could see only 4-5 local vehicles on my way up. The total setting is very serene bringing in peace anywhere we decided to stop. From near the top of the pass, we could see the peak of Mt. Jhomalhari totally snowcapped and the Haa valley across the pass. After spending 45 minutes we start for Haa Valley. . Drive on to Haa, descending all the way for another 22 km (under an hours drive), finally reaching Haa. The Haa Dzong is presently occupied by military, but the view from outside is stunning. After picnic lunch visit to the famous Monastery of Lhakhang Karpo (White Temple) followed by visit to Lhakhang Nagpo (Black Temple).The central shrine in Lhakhang Nagpo is said to have no difference with that of Lhasa JOWO in Tibet. The construction of the Lakhang Karpo is believed to have been assisted by the locality. As a result the place came to be locally known as “Hay” meaning” surprise” which later became “Haa” due to the differences in interpretations and pronunciations of different people over time.The three giant hills looming over the fringes of Haa valley were called “Me Rig Puen Sum” especially after the incidence of the Lhakhang Karpo construction. Today the three hills are popularly known as “Rig Sum Goenpa” signifying three deities-Jambayang Chana Dorji and Chenrizig.Later, other Buddhist saints like Guru Rinpoche and “Machi Labdorn” came to the Jungney Drag in Haa and blessed the locality. The principal religion followed is Drukpa Kagyupa. After the arrival of Shabdrung Ngawang Namgyel, the chief guardian deity of Haa became, Ap Chundu. Now start our return journey. As usual its boring for me. And I did not want to bore you at all to describe this journey, We reached at Jungle Safari Camp at 6.30 p,m. Tired after a long drive, I took a warm shower, enjoy some tribal dance, though it was not cold in Chalsa, had a great hot dinner and retired. 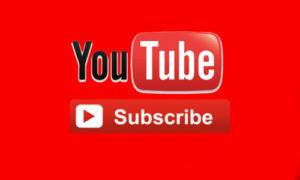 Hi, I am Soumitra.. I am a traveler by heart. I love to travel by road. 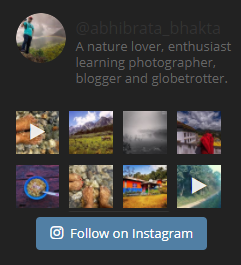 I traveled many places of India including Ladakh,Himachal,Orissa, Chattishgarh and many places of Bengal. I also traveled out side of India like Bhutan. Now i am planing to travel Kolkata to Malayasia with my car. 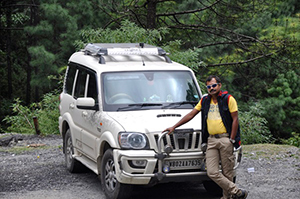 hi,i am Pratim,wish to tour Bhutan by road from kolkata by own car…pls.tell me from where to get the necessary permits for our 4 members and for the car…i had gone through your post and i liked it.We are planning to tour Bhutan in 8 days.Which places can we cover in our stipulated time?Do you face any problem in the road at Bhutan for self driven car? Reading about this article makes me to remember my schooling essay, the way to Milam Glacier!! Like the same I can bring the way to Bhutan before my eyes. Fascinating topic merged with self-drive cars.